The United States suffers from a disproportionately large number of homicides by police. Throughout this nation's history, political and social movements which threaten rule by an economic elite have been suppressed through application of police force. To name a few examples, the labor movement of the 19th-20th centuries in which strikes were violently suppressed by militia and hired guns, the Ludlow, CO Massacre being one of the most notorious incidents; the antiwar protests and civil rights movement of the '60s culminating in the 1968 Chicago Police Riot and the killing of four college students by the Ohio National Guard during a demonstration at Kent State; and the brief Occupy movement of this century. Unjustified police killings that go unpunished because of a biased judicial system have a chilling effect on the exercise of dissent that is constitutionally protected. 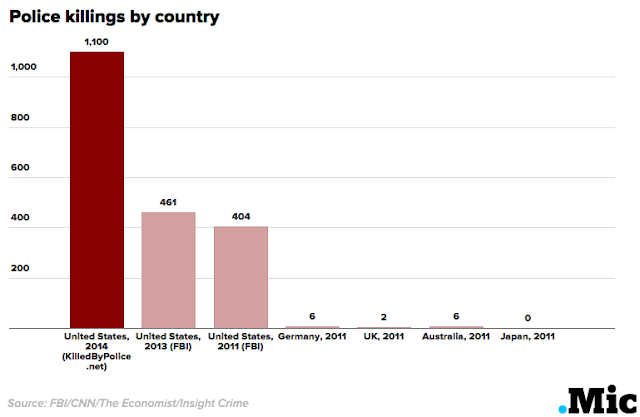 According to the Washington Post, there have been 963 police homicides so far this year. Now we have the deplorable spectacle of the nation's leader encouraging police to use force against immigrants. As one rock star put it: "Better run through the jungle, and don't look back to see!"